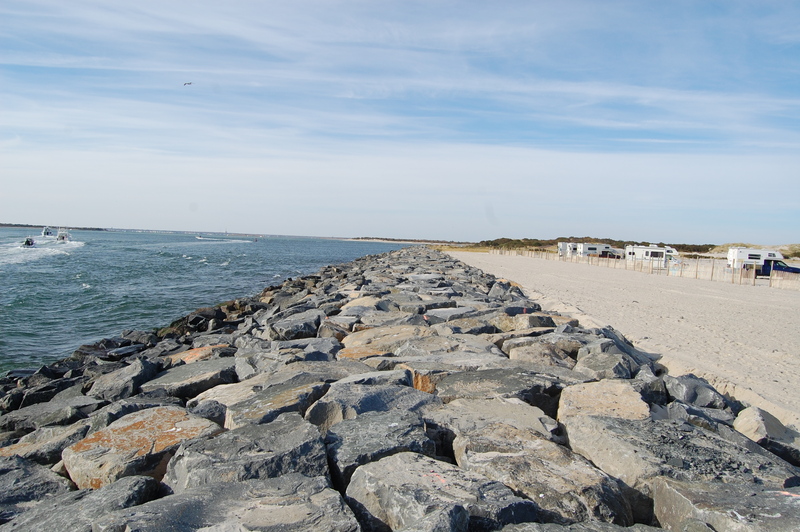 Imagine looking out over Barnegat Inlet from one of the two state parks on either of its shores. The waterway which separates Ocean County’s northern barrier island from Long Beach Island is well-known to boaters for both its productive fishing and its navigational idiosyncrasies that have developed many a Jersey Shore boater’s superior skills at the helm. One day, the maritime landscape may look different. Among several proposals discussed at a meeting last month organized by the U.S. Army Corps of Engineers is a flood gate system that would come in the form of a massive structure crossing the inlet, from about the start of the north jetty at Island Beach State Park to an area just past the elbow-shaped turn on the public walkway along the Long Beach Island shoreline. The flood gate system, known in federal parlance as a “storm surge barrier,” is the most ambitious of 26 studies within a large effort to combat the consequences of sea level rise and storms like Superstorm Sandy from devastating the New Jersey coastline. The flood gate system would place a physical barrier across the inlet to prevent ocean water from flooding into the bay during storms. It would consist of a hard structure built across the water, similar in operation to a rail bridge, including a sector gate, vertical lift gate and an impermeable barrier. The project would also include levees built on either one of both sides. 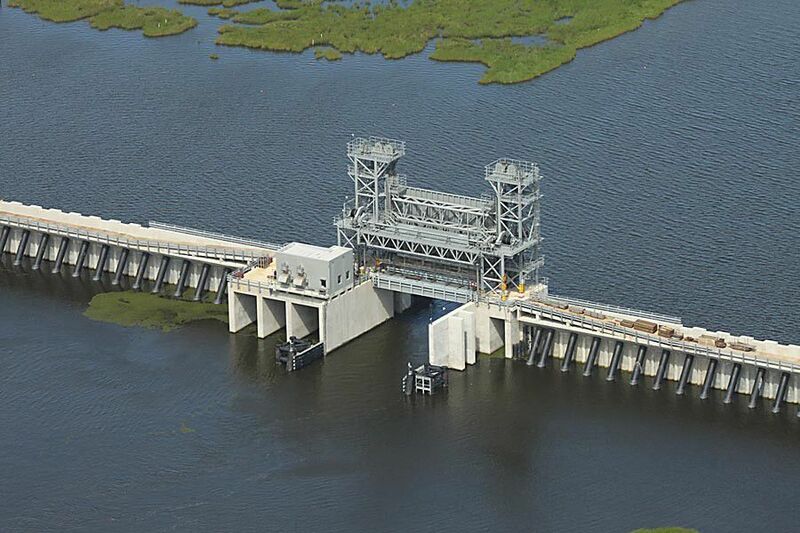 The flood gates would be similar in appearance to the Seabrook flood gate in Louisiana. The meeting, held at Ocean County College, was a discussion led by Army Corps employees, state environmental officials and a number of nonprofit organizations that have an interest in coastal protection. Other methods of back bay flooding protection being studied include “living shorelines,” essentially breakwaters made from shellfish habitat and other natural features arranged in a particular location, and flood walls that would serve as another layer of hard protection – again, similar to those found along the Gulf Coast. Reef construction is another option under consideration to quell the threat, specifically in the area of Good Luck Point in Berkeley Township and Ocean Gate. 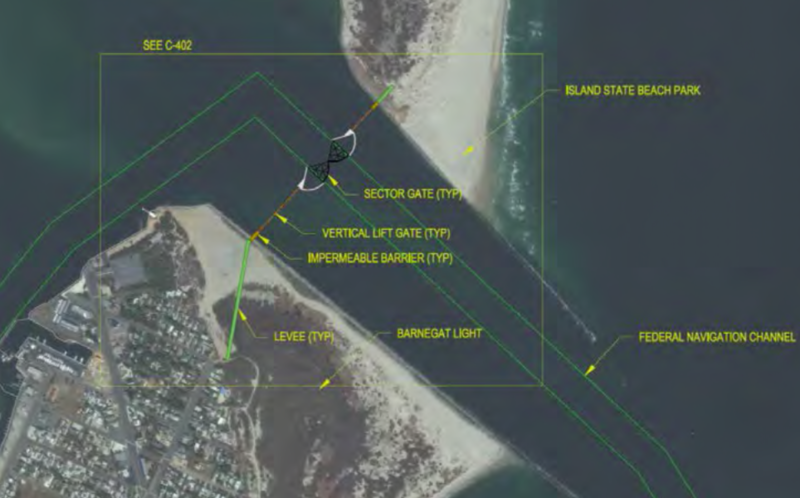 Flood gates have been mostly discussed for Barnegat Inlet, however they are also under consideration for Manasquan Inlet, which separates Point Pleasant Beach and Manasquan. At Manasquan Inlet, hardened levees have already been the subject of a rendering and flood reduction calculations. The flood gates and levees would come at a significant cost, and some critics have questioned their effectiveness. Smith told attendees at the meeting that the state’s southernmost barrier islands – from Brigantine to Cape May – would be arguably the easiest to protect using levees. But Ocean County’s could prove more tedious. “Because of different water levels, different structures assets within the barrier islands and different costs to construct there, there were less [opportunities] for flood wall barriers in our preliminary screenings,” he said. On the mainland, the potential impacts of levees have not been identified within the preliminary screening process. “These are things that can’t be accomplished by individual municipalities,” said Bill Dixon, of the state Department of Environmental Protection. Dixon said the back bay study and its projects – if they come to fruition – would be funded 65 percent by the federal government. Of the remaining 35 percent, three-quarters of the cost would be funded by the state and 25 percent – 8.75 percent total – would be shared by municipalities. Local officials who attended the meeting had mixed reactions to the plan. All we spoke with were in support of the study and most were in support of one or more of the projects under consideration – but nearly every municipality in Ocean County, as well as the county freeholder board, passed resolutions in the last two weeks strongly asking the federal government to speed up the study process. A draft report of the study will be available in 2019, but the final report and environmental impact study is set to be published in 2021. Congressional funding authorization would be provided in 2022, preconstruction would begin in 2023 and construction itself would likely not begin until 2026 or 2027. “The one thing I was concerned about, and I think the council in general, was the timeline,” said Seaside Park Councilwoman Gail Coleman. “They’re going to take seven years to study it and come back with the same old answer,” added fellow Seaside Park Councilwoman Faith Ligouri. Along with the freeholders, Seaside Park and Brick Township were among the towns that passed resolutions asking the federal government to expedite the study.